The fragrance of lavender is contained in its oil, which the plant produces and stores in tiny glands at the base of each floret. The amount and quality of the oil depends on the particular type of lavender and the weather in the season. In order to make perfumery products the oil must be separated from the plant material and this is done by steam distillation. 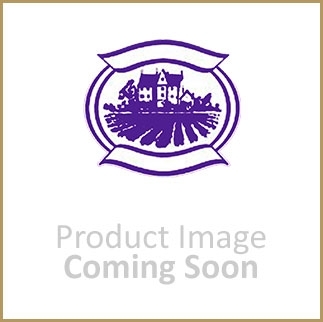 In 1936 Norfolk Lavender bought 3 second hand stills which had been made in 1874 from France and they paid their way only being retired at the end of the 2009 harvest. You may now find them in our distillery alongside the new still. 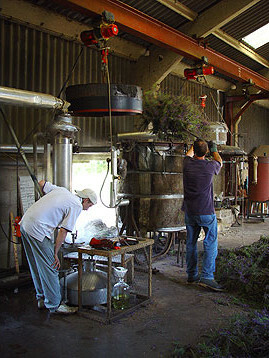 The stills are loaded to capacity by hand with lavender flowers using pitchforks. Steam generated in the boiler is then passed through the still for about half an hour. The heat of the steam causes the oil in the flowers to vaporize and the oil vapour travels with the steam into the next part of the process which is the condenser. In the condenser the steam and oil vapour is cooled until it condenses back into liquid. The mixed liquid of water and the oil from the lavender flowers flows into the separator where the oil which floats on water rises to the top and we are able to tap the oil of. When can we use our oil? The oil we have harvested has to mature for a year before we use it. We then blend it with other ingredients to create our wonderful fragrant products.